On an early summer Sunday in 2012, Andre Sandifer emerged from the New Center apartment he had just moved into with a simple mission: to buy a few groceries. Sandifer and his wife, Abir Ali, both architects and co-owners of Ali Sandifer furniture studio, had just relocated from Chicago with their new baby and two older sons. Ali, a Detroit native, recalls Sandifer giving her a mystified look, asking, "Where do I go?" "That first experience set him off," remembers Ali. 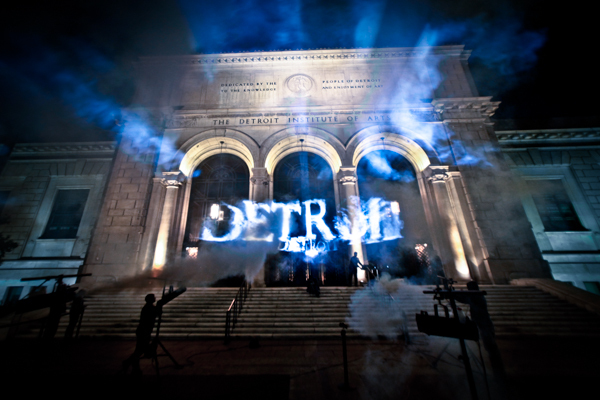 "My husband was not as mentally prepared as I was for living in Detroit. You're not going to have your favorite market on the corner." Sandifer drove all over town that morning, finally ending up at Glory Supermarket in Hamtramck. The selection was not what he was used to in Chicago. Upon returning home, he implored his wife, who had just been selected as a member of the first cohort of the Detroit Revitalization Fellows Program, to consider relocating to Ann Arbor. "It took him a long time to get over it," Ali recalls. "But ironically enough, three years later we were shopping at the new Meijer's on Woodward and at Whole Foods. Andre was remembering that day, and what he remembers most was it feeling like a ghost town. In three years, not only do we have two new grocery stores, but you see so many more people on the street." Ali and Sandifer are part of a growing number of young professionals who have moved to Detroit's urban center in recent years. While the downtown core lost population between 2000 and 2010, it did so at a slower rate than the rest of the city, and during that period became younger, more racially diverse, and more educated, according to 7.2 SQ MI, a 2013 report (of which Ali lead the development) commissioned by the Hudson-Webber Foundation. The same report shows an increased proportion in the age 55 and above cohort, indicating an empty nester trend is also afoot. While conventional wisdom has city-dwelling young professionals running for the suburbs as they start families, many are electing to stay in Detroit to raise their kids, citing a diverse environment, short commutes, rich cultural amenities, and a sense of community as prime reasons for sticking it out. 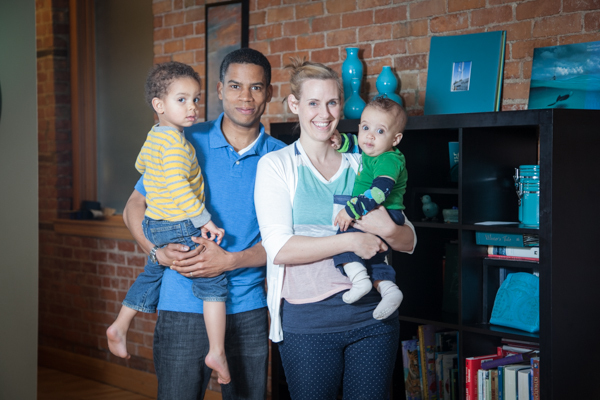 "I'm excited about the different cultural institutions that we have access to by being in Detroit, like museums, theaters, and the library," says Meg Brady, a project manager at Henry Ford Health System who lives with her husband Mike, a consultant for the Detroit Land Bank Authority, and their eighteen-month-old son in New Center. "It's really important to me to raise my child in a diverse setting so that he is exposed to kids from all different backgrounds." And while many suburban Detroiters endure long commutes in order to reap the perceived benefits of living in the burbs, living, working, and raising kids in the city has it's advantages, too. "We have a really great life where our jobs, our home, our childcare, and many of the things we do for fun are all within minutes of each other; and that means we don't spend a lot of time in the car," says Heather Brown. Brown, a child/family therapist and owner of Brown Counseling, and her husband Randal, an attorney, moved to Detroit from the DC metro area eight years ago. They now have a 3-year-old and a 7-month-old. "We walk and ride bikes, and we really enjoy that part of our life," she says. "We have a plot in the community garden, we walk to the bakery, and we've made quite a few friends in the neighborhood. We wanted to be a part of the community where it's mixed with people from all walks of life. We can sit on the front stoop and meet friends and neighbors, and really be known and belong in a place." Keegan Mahoney, program officer at the Hudson-Webber Foundation and his wife Mollie, a civil engineer for the Detroit Army Corps of Engineers, live in West Village and recently welcomed their first child. "Our block in West Village is very tight-knit," says Mahoney. "It's great to have a strong relationship with the people you live around. We both grew up in neighborhoods (Keegan in Ferndale and Mollie in Grosse Pointe) where the block was very close -- it's something we value and we want to have a similar environment for our kids." Of course, safety is top-of-mind for all parents. "Our neighborhood is very safe," says Mahoney. "But we have memories of being able to just get on your bike and ride forever, and walking and biking to school. There was a certain freedom to be off on your own to explore. Outside of our fairly small defined West Village neighborhood, our level of comfort about turning a kid loose right now is pretty low." Mahoney adds that he hopes that changes by the time his child is old enough to ride bikes. Some neighborhoods are certainly safer than others across the city. 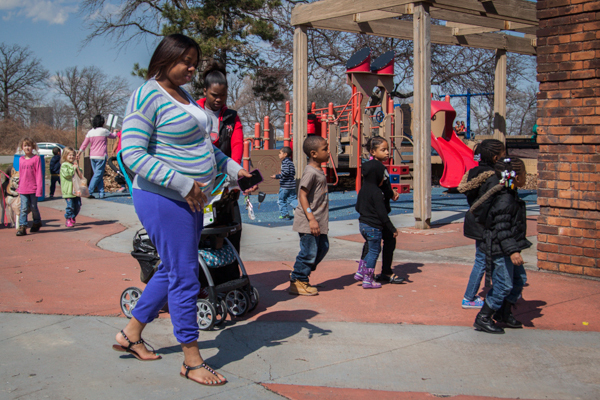 "We cannot let our kids outside without us watching them -- that's just the reality," says Marcellis Smith, who moved back into the city in 2011 with his wife and their sons after having left for the suburbs. The couple, both pastors, felt called to return to serve the poverty-stricken eastside neighborhood at Mack and Marlborough where they had both grown up. Within a month of their return, Smith's oldest son had a gun pointed at him by another kid in the neighborhood. "It was jarring," recalls Smith. "He shrugged it off and said he was fine, so I attribute that to God's providence and grace." Smith recalls praying to God to keep his family safe. "I went to bed with perplexity in my heart, but also felt peace that God will keep and protect us, and he's been faithful to that," he says. According to Brown, safety concerns are just a part of life in any city. "Having lived in other cities, every place has concerns and some places seem scarier than others," she says. "No matter where you live you have a lot of choices in who you connect with, where you go, how you look out for yourself, and what you teach your kids. It is city living -- we have to be a lot more careful." Finding quality schools is another challenge. 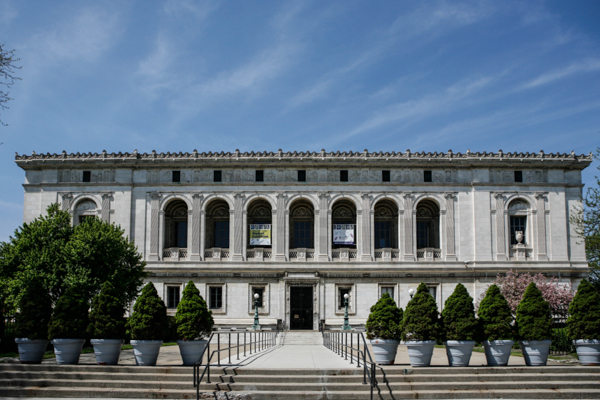 Smith's sons attend private and charter schools both within and outside of the city. "I'm definitely concerned about the educational opportunities for the children that are here," says Smith. "Unfortunately we did not feel good about the DPS schools in our neighborhood." The concept of having access to a local neighborhood school is not the typical reality in Detroit. A 2013 report by Data Driven Detroit illustrates how school closings and upstart charters mean that students often attend schools outside of their neighborhoods. But that can be a positive. "It was actually more of an opportunity to match the boys' personalities to the right schools," says Ali. "We don't mind having them in three different places because we feel it's more catered to who they are." Ali's youngest attends a Chrysler elementary, a DPS school in Lafayette Park, the middle child attends Henry Ford Academy Middle School for Creative Studies, and the toddler is at daycare at Compuware. "We think of the whole greater downtown area as being our neighborhood in a way," Ali adds. Finding information about quality schools has become much easier in recent years thanks to Excellent Schools Detroit, an independent school accountability organization that launched in 2009. The group undertakes independent assessments of all schools within the city -- public, charter, private, and parochial -- creating a scorecard and a list of recommended schools and making that information available to the public on their website. "One of the things you will find is that is hard to find schools in your neighborhood; the concept of neighborhood schools is not the same as when we were growing up," says Nicole de Beaufort, VP for communications and COO at ESD. "So we encourage families to look for the schools that best fit their child. "Good schools do exist in the city, says de Beaufort, and ESD is trying to make it easier for parents to find them while also trying to help all schools improve. "The way our system works now makes it very hard to find the good schools," says de Beaufort. "So we're trying to create that clear picture -- it's like we are wiping fog off the glass." Parents are also starting to help each other out. The Best Classroom Project launched in 2013 as a Facebook group dedicated to finding quality kindergartens for the cohort of kids born after 2009. The group meets monthly to tour local schools and share information. "What we're finding is that there is a greater group of choices than people realize," says Olga Savic Stella, VP for business development at the Detroit Economic Growth Corporation and co-founder of the group. "Our hope is that we will be able to explore some options we would not have otherwise known about, because we are working together." Savic Stella would like to see more parents give Detroit a chance. "It's ultimately a very personal decision," she says. "But in favor of making a choice to raise your children in the city of Detroit as opposed to another part of our regional community, I would say that by living here, we are able to expose our kids to a diverse community that is representative of the world we live in globally. And I think that preparation will equip our kids to be citizens of a global world." As for Smith, he would like to see more African American parents consider returning to the city. "I find a lot of suburbanites and non-African Americans are seeing the potential in the city right now," he says. "African Americans who grew up in the city don't have that view as much and I can't fault that -- the histories are very different. They grew up living under the pressure and strain of violence and blight, and it does take its toll. So for them to pursue the American dream has meant getting out of Detroit. But I would love to see more African-Americans see the value of moving back into the city."